Springdale, Utah is the gateway community to the spectacular Zion National Park. Each year, nearly 3 million visitors pass through this charming little town that is home to many bed and breakfasts, over 700 motel rooms, and over 500 campsites in the vicinity. There are several cozy restaurants and shops, and a local fruit market that sells a wide variety of organic produce. 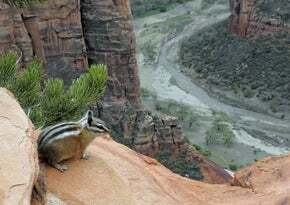 With Zion National Park in her backyard, breathtaking views are inescapable, and a lifetime of hiking and sightseeing opportunities are close at hand. Feel like a short drive? Within an hour you can be in St. George, Cedar City, Kanab, Coral Pink Sand Dunes, Kolob, Smithsonian Butte, Cedar Breaks, Snow Canyon, and more. In two hours you can get to Bryce Canyon National Park, Brian Head Ski Resort, and Lake Powell. From there, it's just a few minutes further to the Grand Canyon. Springdale is a popular year-round destination, and offers a variety of outdoor activities such as hiking, swimming, and tennis. There are also an abundance of rentals available for bicycling, tubing, hiking, and horseback-riding. In addition to area's fantastic outdoor recreation opportunities, there are also many cultural activities and entertainment options, including a 1,000-seat outdoor amphitheater, a giant screen I-Max movie theater, a museum, a playhouse, several art galleries, bookstores, and family concerts. Springdale also plays host to the Southern Utah Folklife Festival, and is home to a bar that features live blues, rock, jazz or folk musicians.